Join Love Hope Strength co-founders, Mike and Jules Peters, and others who share a passion for music, love the great outdoors, who enjoy walking and talking and who want to help save lives! Snowdonia Rocks is a 20k hike with live music along the way, which takes in views of the spectacular Devil’s Kitchen. Suitable for most abilities, Snowdonia Rocks promises to be a family friendly, inclusive day. You’ll take in some of the wonders of Snowdonia on this walk, which offers a chance to reflect, remember and celebrate friends and family affected by cancer and other life changing and life limiting illnesses. On the day registration and the start and finish points of the walk will be at Zip World, Penrhyn Quarry, Bethesda, LL57 4YG. All proceeds of Snowdonia Rocks will support LHS’s three grant schemes: the Get On The List programme; equipment and new facilities in North Wales and in other UK hospitals; support for cancer services across the globe, helping some of the most vulnerable families in underdeveloped countries. Places on the hike are limited so please do register promptly to avoid disappointment! – This Hike is suitable for anyone who can independently walk this distance ordinarily. – There are no huge climbs, but it is not suitable for wheelchair users or pushchairs. – On line sign up for Snowdonia Rocks will be open until Tuesday 18th June. There will be on-the-day sign up for the hike, subject to availability of places. – There is sufficient parking for 300 cars on the Zip World Penrhyn Quarry Site. All additional parking will be at a specified location on Bethesda, approx 1,000 metres away (details to be confirmed), and a shuttle bus will be put on in the evening for those parking there. – On the day registration (mandatory for all Snowdonia Rocks participants) will take place from 7:30 – 9:30 at Zip World Penrhyn Quarry, Bethesda LL57 4YG. The hike will start at 10:00 and you can expect to return to Zip World at around 16:30. This year outdoor food concessions, bars and toilet facilities at Zip World will be available for all hikers to use at the end of the hike. And after the walk…..Relax, unwind and take in the music of Britpop favourites, Cast, the acclaimed Miles Hunt of chart-topping The Wonder Stuff and a host of other fabulous musicians and bands in the evening at ZipRoc, the music festival presented by Zip World in aid of Love Hope Strength and curated by Mike Peters. We are indebted to everyone at Zip World for their support, advice, knowledge and dedication to helping LHS achieve its mission. Please note that you will need to purchase tickets for this event in addition to your Snowdonia Rocks places. You can book tickets for ZipRoc online at www.zipworld.co.uk until Thursday 20th June. Tickets will be available to purchase on the day. 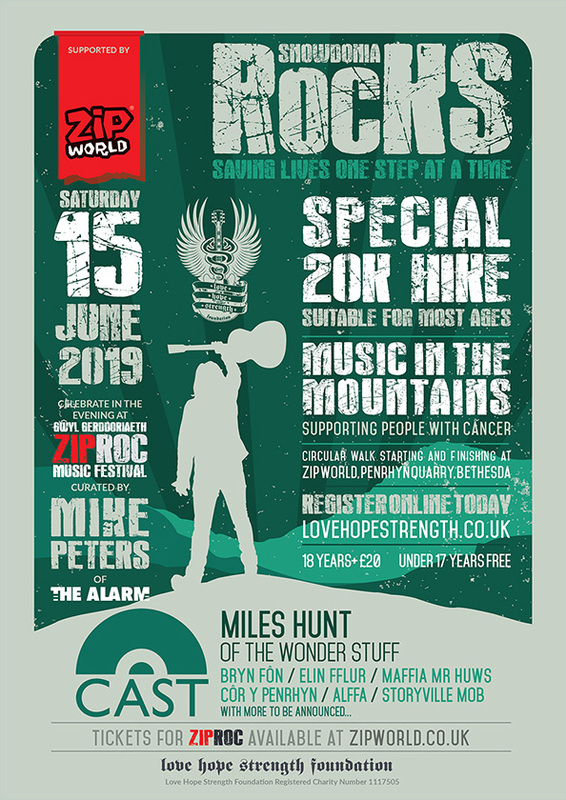 ZipRoc will begin at 2pm with local bands performing, so if friends and family don’t fancy joining you for the Snowdonia Rocks hike they can meet you there! VIP packages for Zip World Rocks include complimentary food and beverages, access to some of the bands and private viewing platforms for the gigs. 1. Participants must start the walk with the other walkers at the official start time. All participants are required to check in upon completion of the walk at the official finish. Any participant withdrawing from the walk earlier must inform a Snowdonia Rocks event official. 2. Any participant uncertain of their physical ability to participate must seek medical advice from a GP before the event. 3. Dogs must be kept on a lead at all times and are the responsibility of their owners throughout the walk. 4. All participants must write their names and details of any health or medication problems on the back of their walker number, which must be unfolded and should be visible throughout the walk. 5. The Snowdonia Rocks organisers reserve the right to refuse access to anyone who: declares false information on their application form; doesn’t make the required payment; or otherwise fails to meet the stated entry requirements. 6. The organisers have made every effort to ensure the event is as safe as possible, but by it’s nature, taking part in Snowdonia Rocks carries certain risks. Participants participate at their own risk and the organisers accept no liability or responsibility for injury or loss whatsoever. 7. By participating, all participants confirm that they are satisfied with their names and any photographs taken during the event to be used to publicise the event. 8. All participants must acknowledge and agree that personal information (including medical information recorded on their walker number) is stored, used and disclosed by the organisers in line with GDPR. 9. Participants are bound by any adjustment made by the organiser which is issued prior to Snowdonia Rocks. 10. In the event that Snowdonia Rocks 2019 has to be cancelled due to force majeure, the organisers are not liable to refund participants. 11. Participants must walk wearing their own officially allocated walker number.